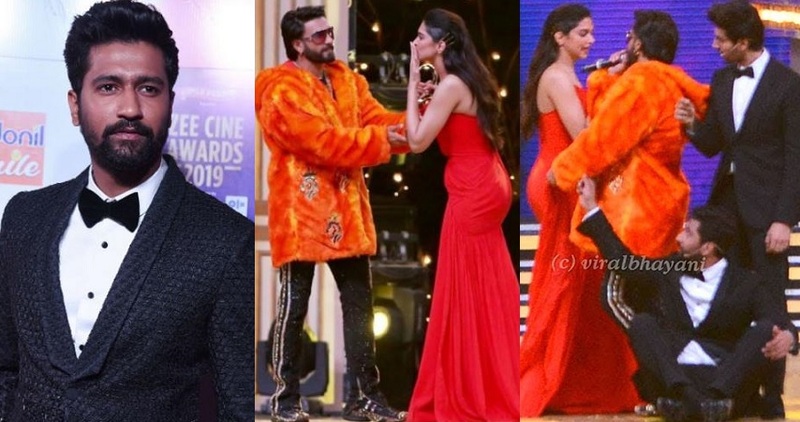 Deepika Padukone and Ranveer Singh won hearts yet again at the Zee Cine Awards 2019 ceremony that was held recently. The couple not only bagged trophies but also managed to win the crowd with their public display of affection for each other during their winning speeches. The hosts of the award show, Vicky Kaushal and Kartik Aaryan also got DeepVeer remarried on the stage. The duo asked the lovely couple to take the pheras in front of the audience and they happily obliged. Further, Vicky and Kartik had another surprise that left Deepika and Ranveer in splits! The two photoshopped themselves in DeepVeer's wedding pictures and projected it for them and the audience who couldn't stop laughing. However, things went a little haywire when Vicky started addressing Deepika as 'Bhabhi' amidst the banter. And this didn't go down well with DP who seemed pretty annoyed by being addressed with that title. She soon chided Vicky and told him to stop referring to her as 'Bhabhi'. However, things soon cooled off and all four of them laughed their hearts out over it. For those unaware, earlier Deepika had got Vicky replaced from Sanjay Leela Bhansali's magnum opus 'Padmaavat' where she played the leading lady. It was reported then that SLB wanted to cast Vicky for the role of Rawal Ratan Singh but Deepika wanted an established actor to be cast opposite her, so Vicky was dropped from the film and Shahid Kapoor was taken on-board. But, looks like things are now all hale and heart between Deepika and Vicky! Get ready for yet another soulful song of Notebook 'Safar' Vidyut raises the notch higher in Junglee with his Action Sequences!